Without any warning, Apple has released iOS 8.1.2 followed shortly after iOS 8.1 for iPhone, iPad, and iPod touch with a number of bug fixes and mainly focuses on restoring ringtones and text tones purchased through iTunes that may have been erroneously removed from device. iOS users who are or were impacted by the disappearing ringtone and text tone issue can update to iOS 8.1.2 by using direct IPSW download links below to install iOS updates by using firmware. 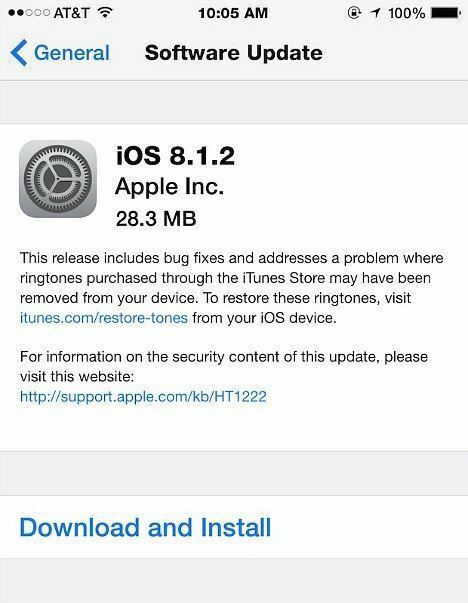 To get the update iOS 8.1.2 over the air, open the Settings on device > General > Software Update, and then click download. The update is around 35MB and available for all devices running iOS 8, which includes the iPhone 4S, 5, 5C, 5S, 6, and 6 Plus, the iPad 2, 3, 4, mini, mini 2, mini 3, Air, and Air 2, and the fifth-gen iPod touch.